I wish it was flat ground! Have you seen any data on how the ball lock compares to Spyderco’s compression lock? You may be able to snag a FFG version Ebay – these are sprint run versions so expect to pay a substantial premium. Actually, I have heard the ball lock will not hold up well to “spinewhacks” – while this knife is billed as a “hard use” knife the ball lock is particularly prone to failing when being used as a striking implement. I would relegate it more to “medium use” and not attempt to use this as a folding pry bar, hammer or any such tool. I have the Manix 2 with the black coat, it is a nice knife, but I think that it is too heavy with the full liners and the jimping on the handle will most likely give blisters during heavy use. Not to fond of hollow ground blades, to me a ful flat ground blade and smoother handle without the jimping all over combined with milled out liners and it would be a better knife, even tough it most likely would be more expensive with those mods. Hey man thanks for stopping by and taking the time to comment. I agree, it’s a little heavy for my tastes with the full liners. I also think that this is a knife that begs for a FFG – which is why I recently picked up a sprint run w/ a FFG BD30P blade and skeletonized liners. In my opinion, this is what the Manix should end up as, and to be honest, I wouldn’t be surprised if Spyderco started doing this in the regular production version as well. I’ll be doing a video review shortly. Also, I agree – the jimping is sharp. I just hate complaining about a lack of jimping, and then complaining when there is too much (if that makes sense). Anyhow, thanks again for dropping by and providing some great food for thought here. 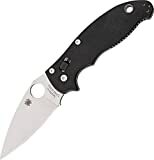 is there any possibility of there being a review of the Spyderco Manix 2 XL??? Certainly I could review one in the future. I don’t really have plans to buy one now, but if I can get my hands on one I will – and then I’d be more than happy to review it. Thanks for asking! It looks like you were right in advicing to get the saber grind version of this knife while you can, because Spiderco might switch to full flat grind on the Manix 2. They did. Good call, Dan. Thanks, Alex. Glad my prediction held true – can’t say that happens often. I hope you and your Manix 2 are reunited shortly! Spyderco claims to have addressed the lock failing from spine whack issue. The newer updated models have a black polymer cage instead of the white/clear cage found on the earlier models that failed spine whacks. Maybe you could update your review to reflect that? Thank you, John. I was not aware of this and appreciate you pointing this out. I have updated the review accordingly. Maybe I should pick up a Manix 2 XL and check it out for myself! Thanks again.